On July 22 the official groundbreaking ceremony took place in Samara. The new stadium will be built outside the city, in its north-eastern outskirts, expected to become surrounded by new developments later. Tatarstan-based PSO Kazan company was selected as general contractor. 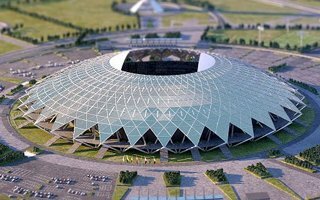 The project is expected to cost RUB 14.5 billion (or €303m / $407m), but this budget does not include the RUB 700 million already spent on the design. Good news for local authorities is that all of the funding will come from the federal budget. Starting in 2014 the investor will cover roughly RUB 4 billion annually, leaving 1.5 billion for 2017, when the project is set for delivery. The 2018 World Cup arena’s most distinctive feature will be its vast dome, spanning over almost 330 meters. The 60-meter high building will have double-tiered stands accommodating 44,000-45,000 people, 1,200 of them in skyboxes.